Today's entry is going to be a bit off-topic (meaning, it is not game related), but will still be fun for the Star Wars fans. 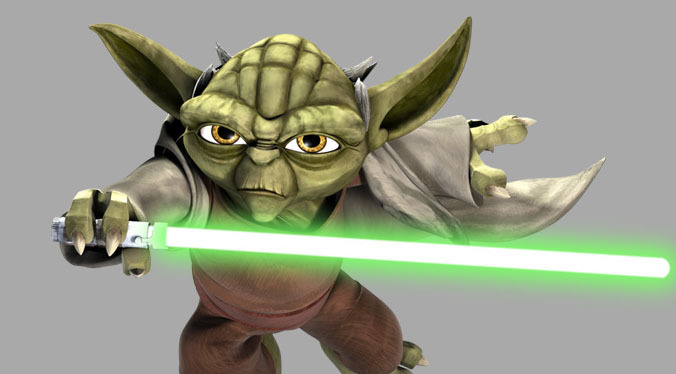 I have been watching some episodes of the Star Wars: The Clone Wars series (2008) lately, and was surprised in the first one by the nimbleness of Yoda, depicted above. (This picture for a change has not been created by me, it's picked from the internet somewhere and looks similar to the Yoda of this series.) His fighting was hilarious and reminded me of a certain furry tree-animal. Watch an excerpt of the episode below and you'll understand what I mean! Yoda fun starting at 0:43. You can imagine how surprised I was when I found on the all knowing source of wisdom called the internet that my suspicions were true all along. Without any doubt, Yoda has been trained by jedi squirrel elite forces!